Friends v Chandos Park B.C. It was a pleasure to be invited to Chandos Park BC in Buckingham to celebrate their 50th Anniversary. 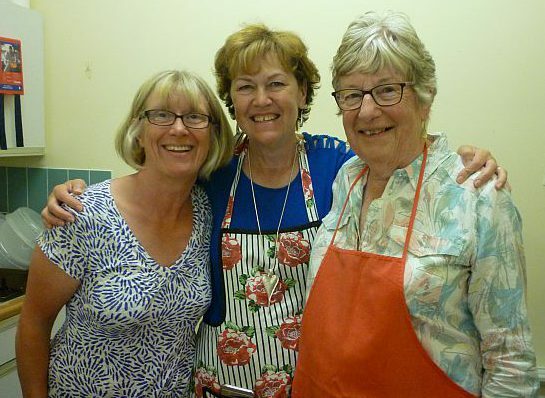 The Friends travelling from 7 Counties (including Beds, Berks, Bucks, Herts, Lincs, Northants, & Wilts) were warmly welcomed with a lavish buffet prepared by Club members; Carolyn, Anne & Jan, with Cheryl serving refreshments from the bar. We were welcomed onto the green by Chairman Andy Hunt and the game commenced. The dark rain clouds dispersed somewhat and we played the match in comfortable temperatures although not troubled by the sun! Throughout the majority of the game the home side were well in the lead however in the last few ends the Friends staged a late run and managed to scrape a 1 shot win. When the scores were announced in the after meal speeches there was a buzz around the room as players claimed their own particularly good shot as the reason for the win! Top rinks were awarded for both sides and by co-incidence the cards showed identical scores of 22-17. Adie Lloyd, Sue Moodey, Ray Keen and Phil Havord for the Friends and John Castle, Nick Aldren, Cyndy Lee & a ringer by the name of Michael Jennings for the home side. Everyone was thanked for their contribution towards a successful day. 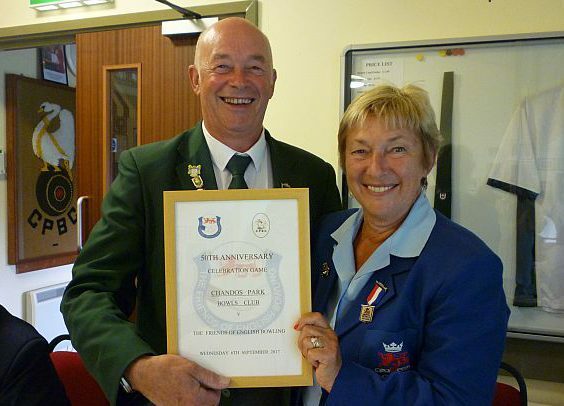 Match Officer Marcia Dunstone presented a Framed Certificate to Andy in commemoration of the occasion. Bucks County President and club member Margaret Langley Roberts had plied us with tickets and proceedings ended with the Raffle being drawn. Thank you to both the Friends for their support and to Chandos Park members for making it a thoroughly enjoyable day.